Cars in Benin, Africa, are communal means of transportation. Motorcycles, we see thousands of those: taxis, delivery and pick up, three family members crowded in one of them, the whole lot. But not cars. There aren’t any in the streets, only in the fringes of town, improvised bus stations where car owners and ride seekers unite under a tree and await. There’s no departure time, no destination established, no precise number of passengers determined. So we wait. For more people, for the right people, headed in similar directions. Payment is like gambling. There’s always and understanding in the end, and no matter how much of a bargain you think you’ve come across, the house always wins. Finally, there are 12 of us. In one car. Four up front, five in the back and three in the trunk, including myself. I see kids, bags, chickens. On top of us, strapped around the hood, bags of crops, seeds and a couch. The wheels give in and we’re running inches above the ground. Nothing works on the control panel. All lights are off, no windows, doors barely shut, only a non-stop horn blows away for the four hours it takes us to drive 100km south, from Kétou to Cotonou, over a red dusty road. As we arrive at the economic capital, I look for a place to change into my outfit before heading into the airport, for what I was wearing in the car is now beyond public exposure. I look like I survived a mine explosion and have just walked out alive. Dressed in better attire, I board the airplane to leave. 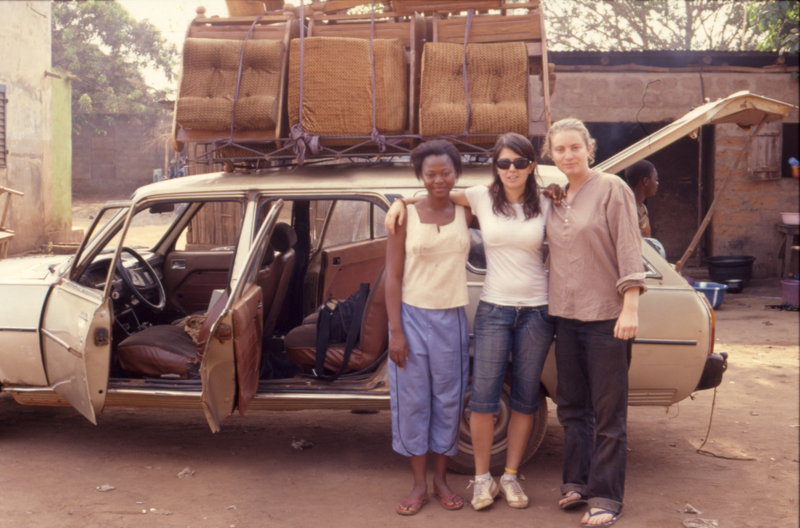 This entry was posted in Non-fiction and tagged Africa, Hitch-hiking, Non-fiction, Writing by mariabitarello. Bookmark the permalink. Maria, I think you saw a business chance there. I will pay you and send you, and only you, to take care of a transportation business in Benin. =) Hard to believe that is their way. Great story! Alice! C’est toi? Oh-la-la, il fait longtemps! !